You may already have heard of Packt, the fast-growing publisher of hardcopy and digital books on specific technologies, due to the large number of Drupal books it has published over the years. 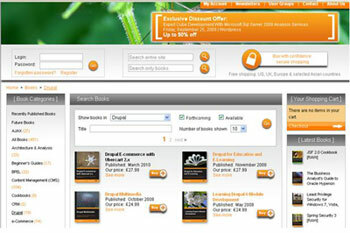 However, you may not be aware that they recently relaunched their website, www.PacktPub.com, using Drupal as its framework. Packt Publishing is a modern, unique publishing company with a focus on producing cutting-edge books for communities of developers, administrators, and newbies alike. Packt has so far published over 15 Drupal books and remains committed to producing practical solution-based books for Drupal developers, along with the best available online bookstore. The new website, which took 12 months from design to launch, was developed with UK-based Bluetel Solutions. The new version not only adds to the existing functionality of Packt’s original website, but now also offers a new, enhanced customer experience with an advanced design.